London Councils and the London Chamber of Commerce and Industry (LCCI) commissioned ComRes to undertake a survey of a thousand businesses across London between April and June 2017. The survey asked businesses about recruitment and retention, apprenticeships and training, migration and the main challenges and opportunities they face, including Brexit. This briefing outlines some of the results from the survey and the implications for policy. This was a pan-London survey but responses were also collected and analysed for London’s economic sub-regional partnerships, as set out in the map below. The data was weighted to be representative of businesses both in London and in each of the sub-regions, as well as by borough, company size and broad industry sector. Sole traders were excluded from the analysis. The survey will be repeated annually for the next two years. Recruitment and retention: When asked about ways to make recruitment easier, just over half of businesses (54 per cent) identified lower costs of transport/commuting within one of their top two priorities. This was followed by better availability and affordability of housing (44 per cent) and fewer restrictions on immigration (31 per cent). Immigration restrictions were a key issue for some business sectors - businesses in accommodation, food and recreation services, communications as well as finance and support services were especially likely to rank lower immigration restrictions as the top way to ease recruitment, making it the second most cited top issue amongst these industries. For retaining staff, the emphasis was again on the availability and affordability of housing, alongside lower transport costs (within the top two priorities for 48 per cent and 45 per cent of businesses respectively). A third priority was better government support for training and development programmes (within the top two priorities for a quarter of the businesses surveyed). These responses suggest that ensuring the costs of transport and commuting remain low or get lower and sufficient homes are built to increase the availability and affordability of housing should be priorities for London’s political leaders. The case for continued investment in infrastructure and housing in London needs to be made to government if the capital is to remain a competitive city that can attract and retain the talent that its businesses need. The need for better government support around training and development suggests that the skills system could be reformed to make it more responsive to business needs. Training and apprenticeships: Private sector training companies were most commonly used to provide external training for businesses (used by 30 per cent of respondents), but only one in 10 business leaders reported use of Apprenticeship Training Associations (11 per cent) or Further Education colleges (10 per cent) to provide their training. This suggests that links between business and the FE sector in London could be strengthened. Despite London and national campaigns on apprenticeships, 41 per cent of businesses surveyed still do not see any benefits to increasing the number of apprentices in their company. This is a sizeable proportion and could make it difficult for London to contribute to the government’s target of delivering 3 million apprenticeships by 2020. London already has low levels of apprenticeship starts compared to other regions of the UK1. The reasons given by businesses which are not planning to using apprenticeship funding relate to their size or stage in their development including being a small business (15 per cent), having no plans to recruit in that period (13 per cent) and lack of space (9 per cent). This suggests smaller businesses need support to take on apprenticeships. London government is proposing that this is one of the activities that unspent apprenticeship levy funding in the capital could be used for – if this funding is retained by London government rather than absorbed back in the national apprenticeship programme (as is currently planned). Encouragingly the vast majority of business respondents that are planning to use apprenticeship funding will do so to employ more apprentices (69 per cent) rather than train existing employees (22 per cent). The apprenticeship levy will fund both, but the survey indicates that businesses are not just using the levy to address training issues among their own workforce but looking at it positively as a means to take on new apprentices and creating job opportunities. Asked what would make them more likely to hire apprentices, financial circumstances were most cited, particularly among micro businesses. Indeed, 15 per cent of business leaders said that increased financial support to pay apprentice wages would make them more likely to hire apprentices. There was a proposal in the Conservative election manifesto to use the apprenticeship levy to cover wage costs during the apprentice training period. However, it is not currently clear whether this proposal will be implemented by the government. Migration: Half (49 per cent) of survey respondents reported employing non-UK staff: two-fifths employed non-UK EU staff, and just under a quarter (24 per cent) employed non-EU staff. A sizeable minority (23 per cent) of London businesses said that more than 25 per cent of their high skilled staff2 were non-UK EU nationals, and 11 per cent reported that was the case for more than half of their workforce. This indicates that the government should consider phasing in any significant changes to immigration after Brexit, given the high reliance of some businesses in London on high skilled EU workers. The reason for employing non-UK workers by London businesses is mainly to access their skills, education or experience. Main challenges: Brexit was identified as the biggest challenge by businesses in London (16 per cent), particularly in important and growing industries such as financial services, arts and culture and the hospitality sector. Two in five (42 per cent) London businesses thought that Brexit would have a negative impact on their business growth over the next 12 months, while 29 per cent expected no impact, and 12 per cent thought their business would experience a positive influence. It is therefore crucial that London has a strong influence on the type of Brexit that the government negotiates with the EU. The cost of domestic taxes or levies (including business rates) was the second biggest challenge, identified by 15 per cent of businesses. This highlights the need for the government to undertake its promised review of business rates, including contributions across different parts of the country. The cost of business space was also among the top five concerns. Boroughs and the GLA need to support the development of business space through planning policy, looking at new ways to accommodate this (including mixed use developments) and aim to get a balance between housing and employment land across the city. Uncertainty in the global economy and a shortage of skills were the final main concerns. The latter reflects London Councils’ concern around the skills system. Devolution of the Adult Education Budget (AEB) from 2019/20 could help towards addressing this but London Councils wants the government to go further and faster on skills devolution – to devolve 16-18 provision, unspent apprenticeship levy and careers information and guidance to London government, in addition to the AEB, which is only a small part of the overall skills system in the capital. • More likely to raise the cost of housing (54 per cent) and transport (49 per cent) as key ways to improve staff retention (top two issues). • Most frequently reported having foreign nationality staff (54 per cent). • Most likely to say that Brexit will have a negative impact on their business growth overall. • Significantly more likely to say they employ UK only nationals (58 per cent). • More likely to suggest increased government support for training programmes will improve staff retention (33 per cent in top 2 issues). • More likely to believe there will be a benefit to their company in increasing the number of apprenticeships. • Have a greater proportion (45 per cent) not planning to recruit staff in the next 12 months (compared to a third for London). • Are least likely to say Brexit will be one of the main challenges for their business (12 per cent) and more likely to say it will have no overall impact on their business. • Are more likely to employ a low proportion of high skilled staff that are non-UK staff. • Are among the least likely to say Brexit will be one of the main challenges for their business (13 per cent). • Have a slightly higher proportion employing non-UK staff (50 per cent). • Are most likely to think they will need to pay the Apprenticeship levy. With the potential of moving towards 100 per cent business rates devolution in London, alongside the challenges and opportunities around Brexit and devolution of the Adult Education Budget (AEB), it is more crucial than ever that London Councils and boroughs understand the views of business leaders from across different parts of London. This is the reason why London Councils has worked with the LCCI to commission this survey and will repeat it for the next two years. • Continue to invest in housing and infrastructure (particularly transport) if businesses are to attract and retain the skilled staff that they need and to make the case for continued investment in London. • Ensure that any new immigration system once the UK leaves the European Union meets the needs of London businesses and key sectors within London. • Continue to make the case for investing in apprenticeships in London to businesses and for resources to support employers, particularly small businesses, in hiring apprenticeships. • Ensure that any devolved system is more responsive to employer needs across the capital, working on a sub-regional basis, as well as pan-London, to pick up the differences highlighted in this survey. 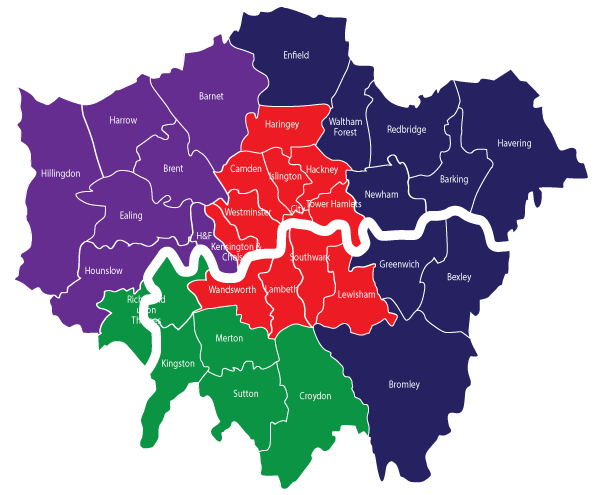 • Ensure that London Councils continues to lobby and work with the government for a reformed business rates system. The survey therefore highlights some important issues that may need greater discussion with businesses (and their representative organisations) to explore the potential for joint work or lobbying between London Councils and business. London Councils and the LCCI will explore this over the coming months.